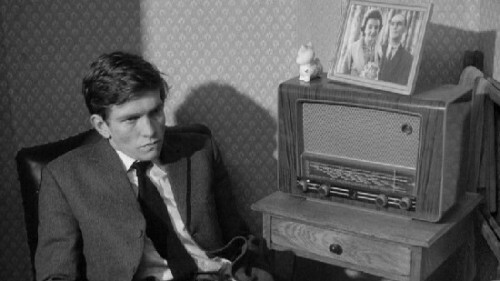 The Loneliness of the Long Distance Runner – Use of Music and Sound In British Working Class Film (Part 4). The Metaphorical Use of Diegetic Sound and Music. The Loneliness of the Long Distance Runner has several different uses of sound; two of which aren’t musical. The title perhaps gives a hint that the sound of running feet on a hard ground will play a vital role in the film. This rhythmic, repetitive sound has a musical quality with its consistent and metaphorical use. Running is a strong metaphor in the film, often for avoiding problems which cascade into ever more issues. The sound of running can be seen to show the constant relentlessness of working class life with no stopping for, or even desire for, middle class tendencies. Diegetic music is used in a similar fashion to This Happy Breed, however the choice of music has the advantage of being after the teenage revolution rather than stuck on the cusp, pre-Elvis and pre- Beatles. However one of the most effective uses of diegetic music comes from an advert for Rolls Royce cars which anticipates Davies’ use of the Shipping Forecast. However, there’s something even more poignant in this advert music. Smith first hears it on the family’s new Television set; an item of luxury bought with the insurance pay out from his father’s death. When the wife is given the £500, she takes the family on a shopping trip to buy all the luxuries of the middle class life that have eluded them. “Precisely because it is an object of the narrative, diegetic music does not generally narrate.” argues Buhler (2001, p.40) and though his argument applies to the popular music used in other segments of the film, this use of advert music does narrate the breakdown of the character. It seems that neither of these criterions applies to Colin’s silence as it is neither tranquil nor fearful. It does however seem a far more subtle way to move around in time than Lean’s overzealous music and zoom shots of calendars in This Happy Breed. Colin often zones out into the past when he’s running or when a sentence from a character recalls something from his past. The use fits in with Gorbman’s (1987, p.18) analysis of silence too and is a strong example of its use as a signifier for the internal; “For nondiegetic silence, the soundtrack is completely without sound. Dream sequences or other filmic depictions of intense mental activity sometimes run to a silent soundtrack.” When running in particular, he’s often free from both the constraints of borstal life and that of his broken household where his mother has found a new man: “before me Dad was cold”. The sourced music of the film roughly splits into two separate elements. The first is when Colin is at his most free and unabated whether it’s when he’s running or when he’s having fun before his borstal times. When Colin and his friend steal a car and pick up two girls, the music has a distinctly dance jazz flavour with a hint of Teddy Boy ethics. This is the music of the youth and though coupled with some flowery flourishes of flutes to signify the innocence of youth, the music has a distinctive feel of early 1960s club music. Gorbman’s (1987, p.58) argument that “…background music functions according to a larger sphere of reference than musical syntax itself.” is correct here and the “sphere of reference” is the era and the age group. This is not exactly freeform jazz but it is more rebellious, than the diegetic music of This Happy Breed. “It seems clear that regardless of the violence with which they might attempt to break from the past, then, artistic movements rely on their predecessors for definition and motivation – even if only to define themselves against them…” argues Flinn showing the parallels between the musical and film score rebellions (1992, p.23). The popular music itself is no doubt reactionary but, in the context of This Happy Breed, its actual presence in the film (rather than just its musicality) is also a type a rebellion. “Jerusalem” as a Metaphor for the Establishment. John Addison’s musical score references a piece of music in such a deliberate fashion that its intentions become more and more clear as the film goes on. After the initial running sounds of the opening scene, the music fades in and seems at first to be almost as typical and tragic as This Happy Breed. However the music is full of familiar motifs that become more and more obvious with each use. The hymn “Jerusalem” is recontextualised and chopped up into the score for small orchestra, coming in specifically when Colin is forced to face authority, hardship and the class divides of the borstal. “Quotation is the importing of a song or musical text, in part or in whole, into the film’s score.” states Kassabian (2001, p.49) and the films nondiegetic score is a perfect example of this. It seems Wagnerian in its use, but mixed with the silence, diegetic music and jazzy side to the score, it’s the most comprehensive and metaphorical score so far in the films about the British working class. Gorbman (1987, p.22) states that “What we may indeed remark about the special expressive effects of diegetic music is its capacity to create irony, in a more “natural” way than nondiegetic music.” and yet because of the metaphorical linkages created for “Jerusalem” in the diegetic world, the nondiegetic score manages to create irony in just as natural a fashion. What at first seemed like a simple goldmine for drama, is now transformed into something that is not just about the working class but something that can speak to them intelligently about the injustices they suffer in society, paving the way for a nostalgic look at the past coupled with a brutally honest depiction of life in our final film, Distant Voices, Still Lives. The Problematic Reception of Derek Jarman’s Blue – Part 3 (Cinematic Screenings). Alphaville (1965) and the Absurdities of Cinema – Jean-Luc Godard.